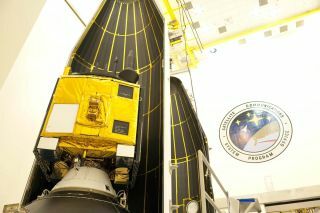 The U.S. Air Force's third Global Positioning System IIF series (GPS IIF-3) satellite is encapsulated inside its United Launch Alliance Delta IV 4-meter diameter payload fairing. Shooting for a morning blastoff Thursday, a United Launch Alliance Delta 4 rocket and Global Positioning System satellite payload will undergo a final technical assessment today and their readiness review tomorrow before entering into countdown operations Wednesday night. "A tremendous amount of work has been accomplished to date on this mission. There's hundreds of people on the satellite and launch teams that have been hard at work to ensure a successful launch and mission. I'm extremely proud of their efforts as they continue to work through the remaining mission-related tasks while maintaining a focus on mission success," said Col. Ron Fortson, the Air Force's mission director for the launch. Liftoff is scheduled for 8:10 a.m. EDT (1210 GMT) at the start of a 19-minute launch opportunity. The window is timed to deliver the GPS 2F-3 satellite directly into Plane A of the navigation network 11,000 miles above Earth. GPS 2F-3 will replace an aging craft -- deployed 19 years ago -- in Plane A, Slot 1, incrementally upgrading the constellation with greater accuracy, better jam-resistance and a new civilian aviation signal, all features of the Boeing-build Block 2F series of spacecraft. The aerospace company expects to have the satellite checked out and ready for handover to Air Force controllers in mid-November, said Jan Heide, Boeing's GPS program director. This will be the third of 12 Block 2F spacecraft being built to form the backbone of the GPS fleet for the next 15 years. "The GPS 2F satellites continue our efforts to modernize our PNT (position, navigation and timing) service and provide new space-based capabilities and ensure improved accuracy and signal availability," said Col. Steve R. Steiner, chief of the GPS Space Systems Division at the Air Force's Space and Missile Systems Center. "We are ready to launch this third GPS 2F satellite," he added. ULA moved the Delta 4 rocket from its horizontal processing hangar to the launch pad in mid-August, erecting the two-stage vehicle atop Complex 37 and attaching a pair of solid-fuel boosters. The GPS satellite arrived at the Cape in July from the Boeing factory in Los Angeles to undergo final testing, the loading of maneuvering fuel and encapsulation within the two-piece nose cone of the rocket. The payload was shipped to the pad and hoisted atop the Delta on Sept. 18 to begin the final push to launch. The integrated systems test between rocket and satellite was conducted on Sept. 21, and technicians spent last week completing tasks like filling the hydrazine bottles on the second stage, installing and connecting ordnance and buttoning up various compartments on the rocket. Managers and engineers will gather today for the final technical assessment of the flight hardware, then move into the Launch Readiness Review tomorrow that culminates with the "go" to begin the countdown on Wednesday evening. Retraction of the mobile service gantry to unveil the 206-foot-tall rocket occurs around 10 p.m. EDT Wednesday, and the Terminal Count picks up at 1:40 a.m. EDT Thursday, with fueling operations starting a short time later. "The team has worked tremendously hard to get us to this point, and following a couple of finally reviews, we are ready to launch GPS 2F-3," said Jerry Jamison, United Launch Alliance's vice president of launch operations. It will be ULA's 9th flight this year. "Our GPS constellation remains healthy, stable and robust. We currently have 31 operational satellites on-orbit, all actively broadcasting position, navigation and timing information to users -- both civilian and military -- around the world," Steiner said. "We do have a very robust constellation, but it is a mix of older and newer satellites." This will be the third replacement GPS satellite carried aloft by the Delta 4 rocket since 2010. The team has a backup opportunity available on the Eastern Range for Friday morning, with a window opening approximately four minutes earlier at 8:06 a.m. EDT. The Range has Saturday set aside for its reconfiguration from Delta to the SpaceX Falcon 9 rocket, which is scheduled for blastoff Sunday evening on the first operational commercial resupply mission to the International Space Station. That launch has three attempts reserved on the Range, if needed. The Range provides the necessary tracking, communications and safety services for Cape launches and needs time between flights of different boosters to reset equipment. The Delta 4 will be taking its 21st flight and the launching for the 9th time in the Medium+ (4,2) variant with a four-meter-diameter upper stage and payload fairing and two strap-on solid motors.